In 1991 I published my first book, Santa Anita. I stumbled on to photographing at the racetrack while searching for a place to photograph here in California with images like I found on the streets of New York and Chicago. You can find Street Photography in California, even Los Angeles now, but it is different because California is so spread out and everyone drives everywhere. The track has it all, people from all walks of life, right there in one place, and easy to move about them photographing, just like being in New York. I continue to photograph at Santa Anita, probably more as a personal retreat than actually working on a new project but that is fine, the process is what matters when photographing. Plus I have been able to photograph two Triple Crown winning horses the last few years by continuing to go out. Anyways in case you are wondering why I am writing a post about a project from 27 years ago today, its because I just was doing a Google Search on myself and came across a couple old reviews of the book which I don’t think I have shared before. Pretty accurate in my mind so I wanted to put do a post on them and thought it best to provide an introduction why I was. Laura Rose of Equine Images Magazine wrote: "In his book Santa Anita, photographer William Karl Valentine captures the pulse of this California racetrack with his camera, The images, chosen from four years' worth of photographs, include everything your eye may pick up during a day at the track - from a classic stretch drive to a refreshing horse bath, from a grandstand littered with people and paper to a lost child in the safe grip of a track security officer." "But the photographs of the people of the track tell just as much of the story, and Valentine has captured them not as snapshot figures, but as friends...it's evident that not only does Valentine know the track, it knows him." Mark Ratzky of the Daily Racing Form wrote: ""Santa Anita" is a must-see for any fan of this racetrack. 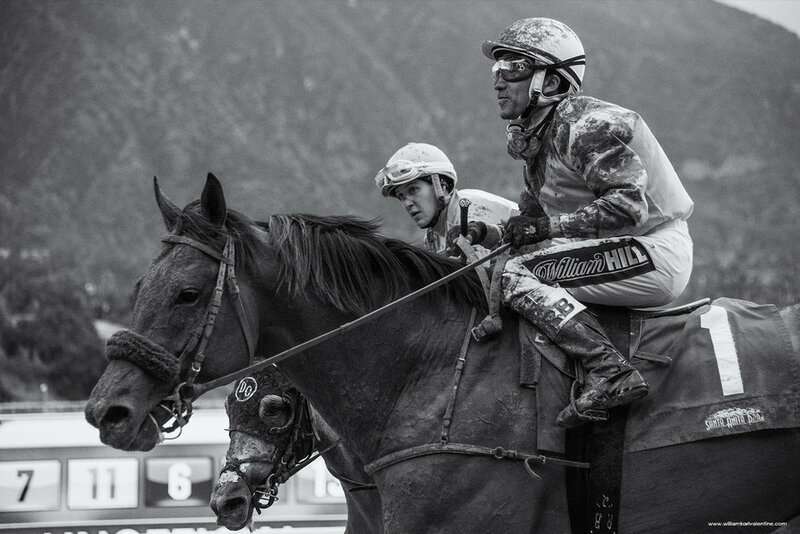 The book contains 80 black and white pictures of just about every aspect of an afternoon at the foot of the beautiful San Gabriels, and really manages to capture a day at the races."